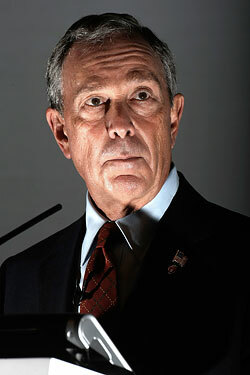 Some folks have suggested that we stay in business to monitor Bloomberg’s third term. We don’t have any plans to continue Bloomberg Watch after today. New Yorkers won’t have to surf the web to understand the consequences of Bloomberg’s reelection—they’ll be plain to see. We suspect, too, that the mayor won’t bother quite as much with the bogus explanations and deceptive politics that have characterized his first eight years. (Those of you who have read Joyce Purnick’s semi-authorized biography will recall Bloomberg’s modus operandi – “Make the customer think he’s getting laid when he’s getting fucked,” New Yorkers, especially tenants, should know the deal by now. Bill Thompson is the only alternative to four more years of Marvin “Markup” Marcus rent hikes. We think it’s likely that Bloomberg will back a move in Albany to end rent regulation. Whatever draconian policies are awaiting their post-election announcements, rent-stabilized tenants who don’t go out to vote for Bill Thompson tomorrow will deserve what they get—and get it they will. Those who do vote will get it right along with them. We thought we’d end with a story of why we began. Readers already know that I was the president of a Mitchell-Lama tenant association at Independence Plaza, a 3,000-3,500-person rental complex in Tribeca. Last week, I told the story of a press conference that Gifford Miller, Christine Quinn’s predecessor as speaker, had called and a tenant rally that we had organized to announce city council legislation on a Miller-Quinn bill that we were going to get passed to force Mitchell-Lama landlords to negotiate in good faith with tenants. The city council scheduled a hearing on the bill. Before the hearing, Ethan Geto, our lobbyist, called to invite me to a Gifford Miller fundraiser at the home of Judith and Robert Rubin on October 27. Months earlier, I had volunteered that I would try to raise some campaign money, not anywhere near as much as the real estate crowd, but maybe enough for Miller to notice. It was time to make good on the commitment. In a previous post I described a meeting with Laurence (“Call me Larry”) Gluck, the new owner of our Mitchell-Lama development, Independence Plaza. He was planning to take the development out of the program and go to market rents as quickly as possible. With the exception of tenants whose low incomes qualified them for housing vouchers, the rest of the 3000-3500 tenants would be unprotected. We were determined to stop him. We knew Albany and the courts would be hopeless. Instead, we had prepared and negotiated city council legislation. Gifford Miller, Christine Quinn’s predecessor as speaker, had agreed to sponsor the legislation. Quinn had agreed to co-sponsor it. Eventually, we assembled a veto-proof majority of the city council. You might think that with the speaker and a veto-proof majority, we were home free. We knew it was only the beginning. It is by now a cliché that every crisis is an opportunity. The Obama administration is using the nation’s multiple crises to transform virtually every aspect of domestic and foreign policy. Whether or not one agrees with the policies, the public is in broad agreement that the president is acting out of what he regards as the country’s best interests. Regrettably, the crisis-opportunity formula as applied to the city’s perpetual housing crises yields very different results. The crisis is real enough but the opportunities are all about maximizing profits, and entrenching cooperative politicians in office. That’s the real meaning of the public-private partnerships that theoreticians and government officials are fond of talking about. If further proof is needed, we would only point to the transparently bogus claim that “continued leadership in this moment of crisis” requires the mayor and city council members who otherwise would be term limited to serve at least another four years. That was the wise advice that Bill Moyer’s father gave him when he took the job as Lyndon Johnson’s press secretary. In New York politics, it would represent a giant ethical leap forward. The Independence Plaza tenant board has been in office for a number of years. There is a contested election. I headed the tenant board from 2000 to 2004 and resigned shortly after we concluded the negotiations with Laurence Gluck. From time to time people ask my opinion about various landlord-tenant matters. I always say to them “Thankfully I’m out of the loop.” I’ve experienced first-hand how nasty these tenant fights can be and life is short. Tonight a letter written by the challengers was attached to my door. It’s not only the myth-making that surrounds the Bloomberg plan to build new affordable housing that’s so galling, but also the bogus claim of preserving that which already exists. Here’s a video of Janel Towers residents in the Bronx, who are doing what they can to save their own homes. In 2000, I became the tenant president of Independence Plaza, a 3,500-person rental development in Lower Manhattan. Completed in 1974, its three 39-story towers and 48 low-rise buildings overlook the Hudson River. The complex was financed by the federal, state, and city governments under the Mitchell-Lama program, arguably the nation’s most successful affordable housing program. Its residents — those who remain after it was privatized under Bloomberg — are African-American, Caucasian, Hispanic, Asian-American — people of every race, class and ethnicity. Many lived at Independence Plaza from the time it was first occupied. Most are poor or moderate-income families who moved in because of the cheap rents. The neighborhood didn’t even have a supermarket or public school in those days. A few tenants whose incomes have risen beyond the limits that initially qualified them for an apartment paid surcharges of as much as 50%, still low when compared to the local real estate market. My wife and I moved to Independence Plaza in the eighties, shortly before the neighborhood became widely known as TriBeCa (the Triangle Below Canal Street). It would soon be one of the hottest real estate markets in the country. Sadly, we’ve watched our neighbors, who raised their families here and whose kids attended the local public schools, replaced mostly by young, white professionals. Often the newcomers double up to share the $5,500 a month rent. It’s easy to tell them apart from the old-timers. Have any stories/experiences with the Bloomberg administration that you’d like to see published on our site? Let us know, we’d love to hear from you. The woman had three kids with her. The oldest was a boy maybe thirteen. He and his mother were walking uptown on Third Avenue. They were struggling with three beat up old suitcases. Everything they owned. The two little girls were trailing along behind. Pigtails and white dresses. They all looked so weary. The boy, just a skinny kid, was lugging the heaviest suitcase trying to look tough. I knew they were heading for some kind of SRO or shelter where he, the man of the family, would have to deal with who knows what kind of evil. It makes me sad to think about that mother and her kids. It makes me mad as hell to think about the callousness of New York’s mayor and political allies — especially the real estate crowd. The real estate industry controls the agenda in the city. If they don’t want something to happen, it doesn’t happen…It’s just incredible how much influence they have. The direction comes from the mayor, and the mayor’s pro-development. “Pro-development” is one way to view the mayor’s agenda. He is certainly that. But for the homeless mother and her three kids or for the 1,096,273 low-income households who, once the rent is paid, have about $30 a week per family member for medical, transportation, education, food and all other expenses, the word doesn’t quite capture the cruelty and destructiveness of his policies.